ValleyCats to partner with Harlem Globetrotters, Make-A-Wish Northeast New York, on Swishes for Wishes Night at "The Joe!" Make-A-Wish Northeast New York CEO Bill Trigg with wish kid Patrick Buffaline, Tay "Firefly" Fisher of the Harlem Globetrotters, SouthPaw and ValleyCats Assistant General Manager Michelle Skinner. 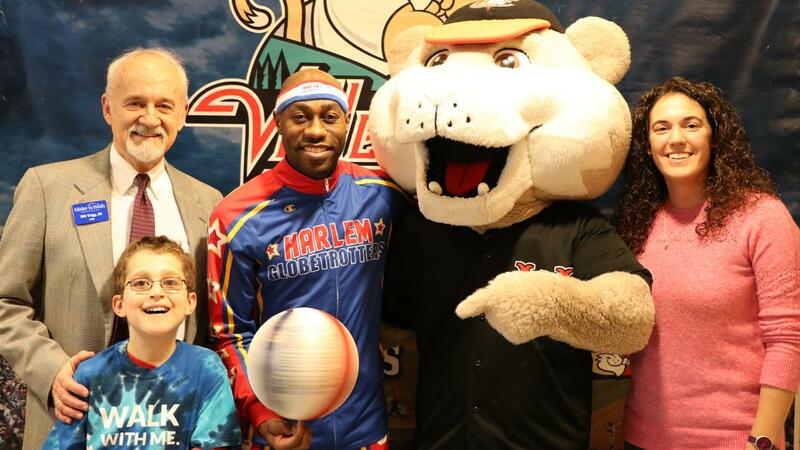 TROY, NY - The Tri-City ValleyCats and Make-A-Wish Northeast New York have announced a partnership with the world famous Harlem Globetrotters to host "Swishes for Wishes Night" at Joseph L. Bruno Stadium this summer. This unique fundraising theme night will take place on Sunday, July 28 as the ValleyCats take on the Connecticut Tigers at 5:00pm. The ValleyCats will be wearing Globetrotters-themed baseball jerseys which will be auctioned off during the game to benefit Make-A-Wish Northeast New York. To add to the festivities, there will be a pregame ceremonial "first pass," wish family picnic, mystery autographed items, and a postgame launch-a-ball. All proceeds will help fund the approximately 100 wishes to be granted this year for children and teens in the Capital Region. "Having the opportunity to partner with the Harlem Globetrotters, a world-renowned leader in family entertainment, in support of such a great cause, was a no-brainer," said ValleyCats Assistant General Manager Michelle Skinner. "This is a first-of-a-kind partnership across Minor League Baseball, which will go a very long way in helping Make-A-Wish Northeast New York grant life-changing wishes for children battling critical illnesses." Further details, including a potential appearance by a member of the Harlem Globetrotters, will be announced at a later date. Individual tickets for the ValleyCats 2019 season go on sale March 28. To view the ValleyCats 2019 season schedule, purchase ticket plans, or to book a group outing, log on to tcvalleycats.com. For more information, call the ValleyCats administrative offices at 518-629-CATS (2287), or stop by the Joseph L. Bruno Stadium box office. The Harlem Globetrotters are set to entertain the Capital Region this Sunday with their brand new Fan Powered World Tour at the Times Union Center in Albany beginning at 3:00pm. Check out HarlemGlobetrotters.com for show details. Use code VALLEYCATS at checkout and save 25% on tickets.